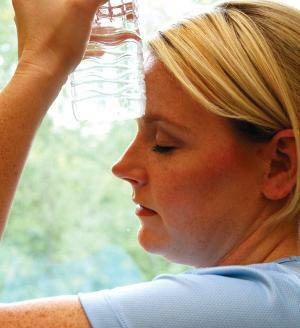 The dreaded hot flush, experienced by three out four women during menopause, is believed to have an upside. New research suggests that women who suffer from hot flushes and night sweats may be at lower risk for cardiovascular disease, stroke, and death. "While they are certainly bothersome, hot flushes may not be all bad," Emily Szmuilowicz, MD, endocrinologist at Northwestern Medicine and lead author of the study, was quoted saying. "Our research found that despite previous reports suggesting that menopause symptoms were associated with increased levels of risk markers for heart disease, such as blood pressure and cholesterol, the actual outcomes tell a different story." Szmuilowicz, who co-chaired the study along with JoAnn Manson, MD, DrPH, and Ellen Seely, MD from Harvard Medical School, reviewed medical information from 60,000 women who were enrolled in the Women's Health Initiative Observational Study and followed for ten years, to determine the relationship between menopause symptoms and cardiovascular events. Subjects were grouped into four categories – women who experienced hot flushes and night sweats at the onset of menopause, later in menopause, during both time periods, and not at all. "We found that women who experienced symptoms when they began menopause had fewer cardiovascular events than those who experienced hot flashes late in menopause or not at all," said Szmuilowicz. "It is reassuring that these symptoms, which are experienced by so many women, do not seem to correlate with increased risk of cardiovascular disease," said Szmuilowicz. Szmuilowicz and team say more research needs to be done in order to understand the mechanisms behind the association, but say it's good news for the millions of women who experience these troublesome symptoms at the time of menopause. "Hot flushes will never be enjoyable, but perhaps these findings will make them more tolerable," said Szmuilowicz.